Pumpkin doesn't really call my name until we are well into October and I begin thinking of pumpkin pie. There is, however, one exception to my somewhat Pavlovian reaction to the season: the pumpkin-chocolate chip muffins I make and, for whatever reason, seem to speak my language no matter what time of year. If you google "pumpkin pancakes" you'll get a host of recipes. Other than a few tweaks here and there... most having to do with the amount or type of flour, whether to use granulated or brown sugar, the option of using pumpkin pie spice mix or a mix of pumpkin pie spices (meaning you select the mix and amount of spices), etc... the recipes are somewhat similar. 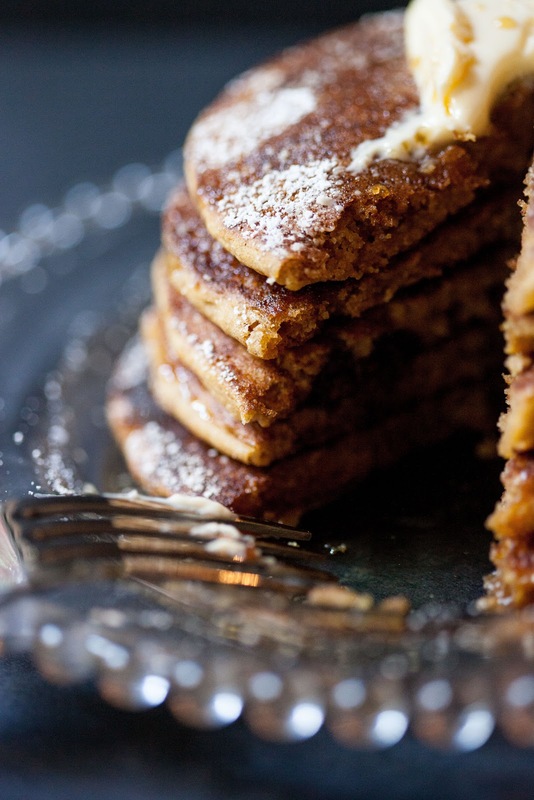 I took a peek at the results of this query... and my own favorite pumpkin-chocolate chip muffin recipe.. in mixing the batter for these pumpkin pancakes. Both muffins and pancakes are considered "quick breads" so the fundamentals of making each are similar with, perhaps, the main difference being that you want a wetter batter with pancakes... and one that isn't quite as sweet as a muffin batter. The result? Pretty much pancake perfection. First of all, I used Bob's Red Mill Gluten-Free Pancake Mix. I would never have normally considered this mix since I'm not gluten-intolerant; however, I recently tasted the gluten-free pancakes at one of our favorite brunch spots and think they may be the best I've had while eating out... making this mix our mix of choice now. Though I'm not entirely sure what all they added, I was told that they use soy milk. Since I went the pumpkin route on these particular cakes, the rest of my additives follow that path of flavor. These are fluffy, moist pancakes that hint at the flavors of pumpkin pie without becoming an after-dinner dessert. They offer a subtle pumpkin flavor with just the right amount of sweetness... a level that welcomes the addition of powdered sugar and maple syrup with open arms instead of a weak embrace. It's a pancake that can be as easily flipped for breakfast as it can be a flip for dinner (sometimes even better). And, like my favorite pumpkin muffin, one which plays beautifully with chocolate. It's a pancake that will have pumpkin calling my name well in Spring and Summer... loud, clear... and subtly sweet. 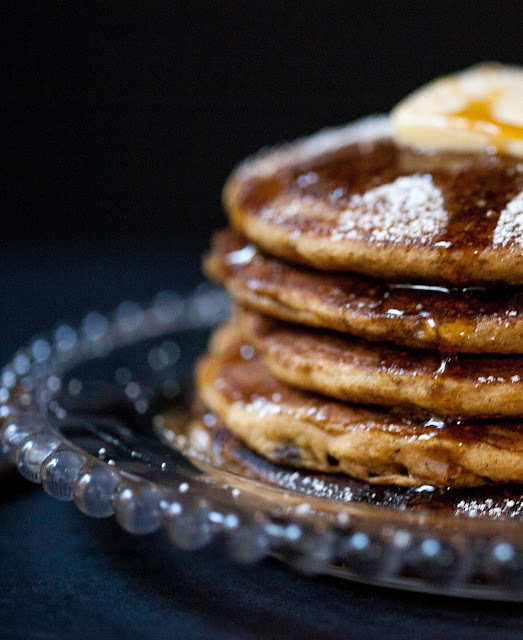 By using soy milk and vegan buttery sticks (and not incorporating chocolate chips) these are great, dairy-free pancakes... in addition to being gluten-free. In a large bowl, combine pancake mix, brown sugar, baking powder, salt, and spices, using a whisk. * Set aside. In another bowl, lightly whisk pumpkin puree, milk, egg, and melted butter. Add to dry ingredients and combine, without over mixing. Lightly grease griddle set over medium heat. Pour a scant 1/4 batter onto griddle to form an approximate 4" round. Allow to cook until bubbles begin to form on top (about 2 to 3 minutes). (note: if you are adding chocolate chips, sprinkle approximately a dozen chips atop pancake right after pouring batter onto griddle.) Flip and continue cooking for another 2 to 3 minutes, until golden. Continue with remaining batter. 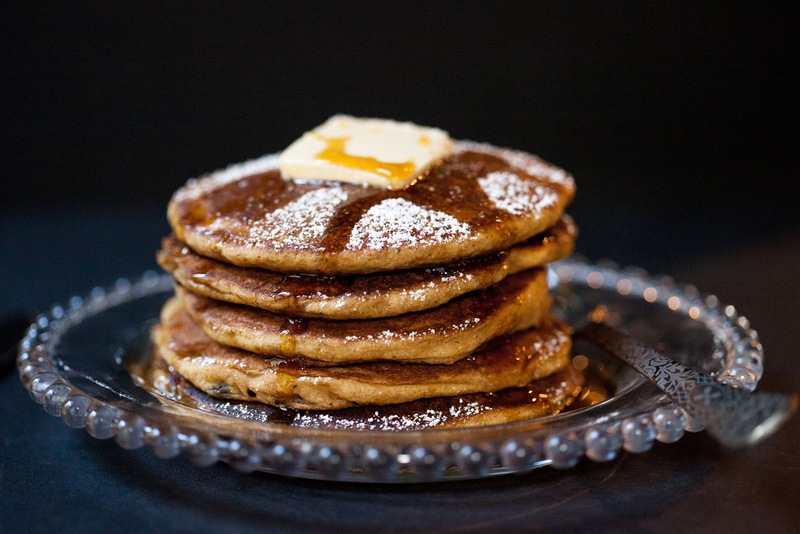 Serve with butter, powdered sugar and pure maple syrup to top. * when sifting dry ingredients isn't called for, a whisk is an efficient utensil.